Winter has arrived, but so has the citrus fruit matured. I picked a bucket of Australian Limes which had ripened to the point of mostly yellow skin. Being a bit partial to Lime Marmalade, I have cooked up a couple of 4kg batches of high fruit content marmalade and bottled it. 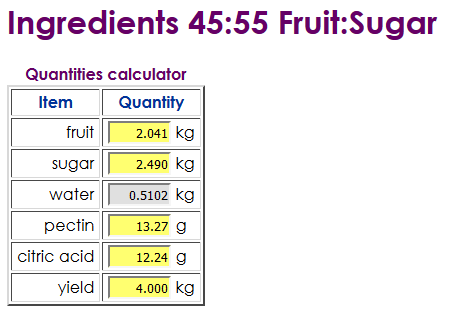 It is the first time I have made jam from these, and essentially I used the 45:55 mix from FAO’s Generic Jam Recipe, though being limes no acid was needed, in fact about 2.5g of Sodium Bicarbonate per kg of fruit to achieve the ideal pH of 3.2-3.3. 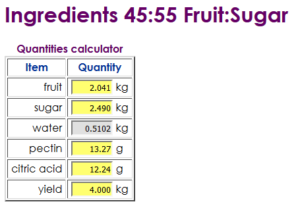 The limes were cooked to release some Pectin, but a little Pectin 6g/kg) was added as the cooked fruit gave a slightly weak reaction in Methylated Spirits. 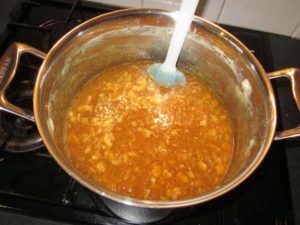 Endpoint was assessed by weighing the pot from time to time until the jam had cooked down to the target 4kg of product.